Arctic Musk Oxen Activity Sheet – Download the FREE printable Musk Oxen worksheet for kids. This easy science activity sheet, is suitable for Grammar school kids in Grades 1-5, as well as for Pre-K and Kindergarten kids. Pre-K & Kindergarten kids can learn fun facts about the arctic musk oxen and use this activity sheet as a listening comprehension tool. Grammar & Elementary school kids can enjoy the Musk Oxen facts worksheet as a reading comprehension game. 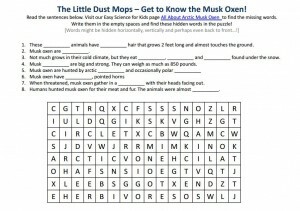 The hidden word search puzzle is a fun way for kids to learn fun facts about Arctic Musk Oxen. Our Easy Kids Science Website offers the best FREE easy science kids activity sheet printables. Musk oxen are arctic mammals. The Musk Oxen’s diet consists mostly of plants. Arctic Musk Oxen have very thick long hair to keep them warm during cold winter months. Therefore, the Arctic musk oxen looks like a hairy mop. At times, the male Oxen fight each other over territory. Discover more Musk Oxen facts for kids by downloading the free Arctic Musk Oxen activity sheet. [sociallocker]Download easy kids activity sheet about the Arctic Musk Oxen. Download FREE Arctic Musk Oxen Activity Sheet for Kids! Did you like the Arctic Musk Oxen Activity Sheet? Read lengthy info about the Arctic Musk Oxen here. Declan, Tobin. " Arctic Musk Oxen Activity Sheet - Easy Science Kids Activity Sheet Printables - ." Easy Science for Kids, Apr 2019. Web. 23 Apr 2019. < https://easyscienceforkids.com/arctic-musk-oxen-activity-sheet-easy-science-kids-activity-sheet-printables/ >.